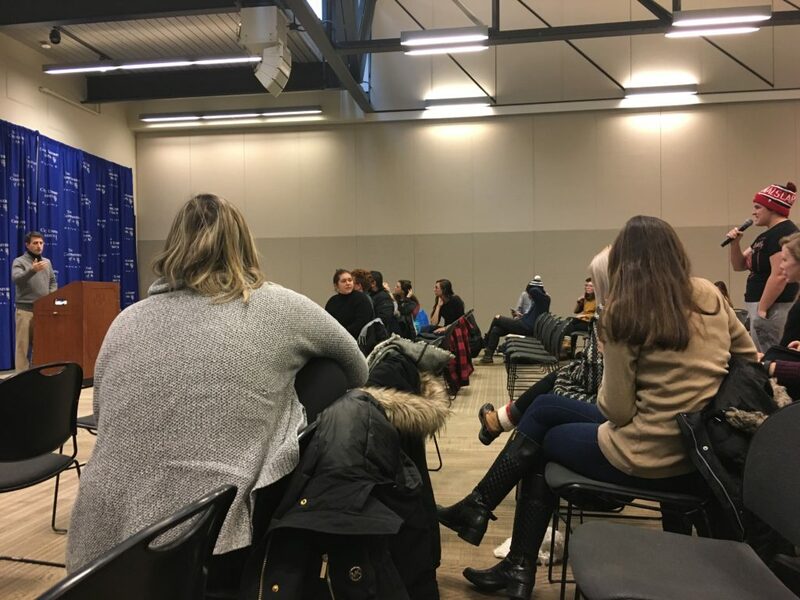 A snow day cancellation of classes did not stop students in the Media and Communication Studies, Drama, and Art departments from coming to meet with Provost Andrew Abela to discuss the Academic Renewal proposal. Held in the Pryzbyla Center Great Room, the meeting on Wednesday, March 20th specifically covered the ramifications involving the first resolution of the proposal — the plan to move all academic programs of the aforementioned departments along with the Music School, and selected faculty into a new “School of Music, Visual, and Performing Arts”. More than 100 students came to ask questions and share concerns about the proposed changes which would go into effect after a final vote by the university’s Board of Trustees on June 5th. Abela invited all students from the three departments to meet so he could explain and clarify the proposal in person while taking questions on how the changes would impact the academic experience. Students voiced concerns on the impact a new school would have on the credibility of their degrees, the effect that part-time instruction would have on their education, and the combination of media and art. Abela began the meeting by explaining the rationale behind the proposal to merge the Art and Media and Communication Studies departments into one “Arts and Communications” department. He cited talk amongst departments for years about starting a new major in film production to provide a film and video focus for students, and noted that a recent donor has prepared to give the school $500,000 towards this film program. Abela said that the Art and Media departments have not been able to coordinate which should lead the film program, so the proposal was made to just put the two departments together to solve the stall in progress. The effort, from the proposal’s point of view, would improve the quality of the departments and attract new students. Multiple questions of a similar theme followed: video production is just an aspect of each of the departments’ curricula — how will this emphasis attract new students who don’t come to study film? Students worried that it would actually hurt the value of the major, slowly disregarding some of the humanities-based focuses at the core of each department, like media literacy and art theory. In his response to the concerns, Abela stressed that the new film production major would only add to, and not take away from, the current academic programs. He repeated that course offerings would remain the same, and said it should not be a worry for those concerned that a new school without any history would lack credibility, pointing to recent success with the new business school. Abela explained the idea behind the new school further, noting that a new building for the arts is expected to be built, which would be an ideal place to house these departments together. In general though, the responses continued to oppose the inclusion of Media and Communication Studies in this new school specifically. Abela, taking notes on each student’s thoughts, made note of the amount of perspectives in that favor. Students left the meeting feeling that their opinions were at least heard, but hoped it would continue that way. The aspect that Provost admittedly did not enjoy reading and the students did not enjoy hearing was the reduction in faculty to make these changes. Abela explained that teaching loads would be increased to a three class per semester plan, a standard described in the faculty handbook. The increased loads would allow faculty to be cut while the amount of courses stay the same, according to self-studies the office completed in the last year. In the proposal, the Art department would lose one of its three full-time faculty, Media would lose three of its five full-time, Drama would lose one of its eight full-time, and the Music School would lose four of its nineteen full-time instructors. Most of these departures will be voluntary, but students worry that resulting part-time and adjunct instruction would hurt the quality of education and community. “I am just worried that we are going to lose this sense of community with these changes, because it’s one of the strongest things we have here,” said Christian McCarren, a junior media major. Abela acknowledged this as the most powerful argument he had heard, and thanked the crowd for giving him helpful insight on the student perspective. “When I presented this to the Senate, it was not my goal to get this approved as written, it’s my goal to get discussion going on and make amends to the point where we get a consensus and go forward,” Abela said. To the concern about continued dialogue, Abela described the process in which the proposal must progress before a final vote. It must be reviewed by the Academic Senate twice more, as well as an ad hoc committee and an academic affairs committee of the Board of Trustees. These committees have student representation in the form of a few SGA members like Vice President Jon Paul Weiss, who reiterated his role in being a channel of communication with students concerning the proposal. Students are welcome to attend the Senate meetings and voice concerns, or raise them with faculty who can then get in contact with members of the Academic Senate. I hate to think of losing a Drama teacher; each is a specialist in an area of drama and theatre. It would not only be adding courses by remaining faculty, it would be losing one who is a specialist in an area for which the replacement probably won’t equal his/her experience and in depth skills.